Taylor Cullity Lethlean were engaged in 2007 to assist DTEI in the preparation of a reference design for the urban and landscape design component of the Northern Expressway. Taylor Cullity Lethlean formed a team involving architects Tonkin Zulaikha Greer, lighting specialist Bluebottle, sculptor Robert Owen and illustration artist Robin Eley. All work was lead and managed by Taylor Cullity Lethlean. A highly collaborative process was undertaken with DTEI staff, particularly NEXY landscape architect Jordana Wilson. Extensive collaboration also occurred with environmental managers, structural and civil engineers. Upon commencement of the project, the reference design took into account the analysis of the northern plains landscape and familiarisation with the extensive previous work undertaken. This included the overriding flatness of the plains, the long views to the hills to the east, the horticultural history of the area, the importance of indigenous history and the Gawler River, and regional context of the route traversing the plains between the foothills near Gawler in the east and the coastal flats to the west. It was decided that the expressway interchanges should be left open to accentuate the flatness and long views that are characteristic of the northern plains. Horizontality was expressed strongly in the bridge design with a series of calculated interventions designed to ‘stretch’ the bridges. It was argued that in such a flat landscape every bridge would become a landmark visible over long distances, and that they should be designed carefully with considerable aesthetic input. Of course all this was to be done without adding to the cost. At each end of the expressway significant transition experiences were designed. At the Gawler end the Gawler Bypass interchange was manipulated to incorporate sculptural elements which formed a gateway experience. 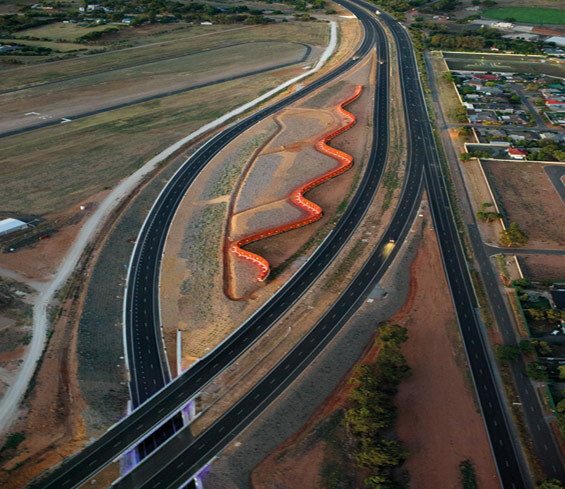 A 400m long ‘Snake Wall’ inspired by the indigenous Red Bellied Black Snake greets drivers as they approach the interchange from the east. This 5m high linear sculpture designed by TCL and Robert Owen was constructed from laser cut steel. 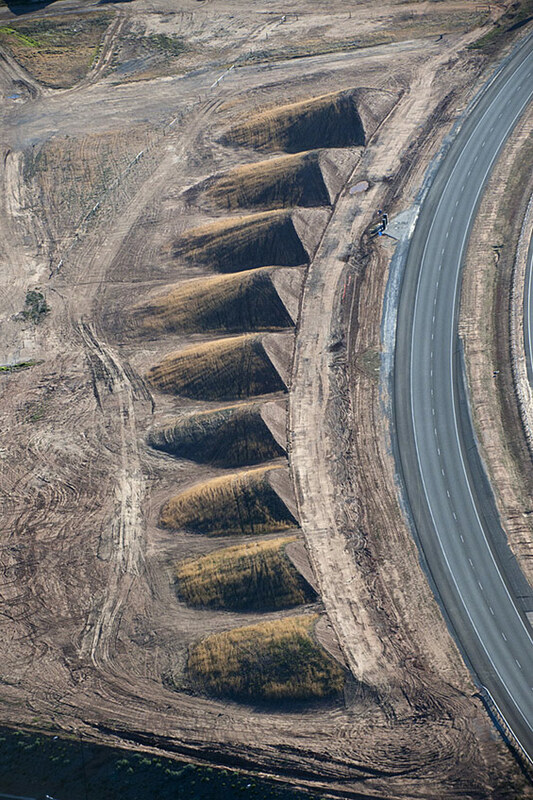 On leaving the Snake Wall a series of sculpted mounds extend 400m beyond, thus resulting in an approximately 1km long installation designed to be viewed at speed. 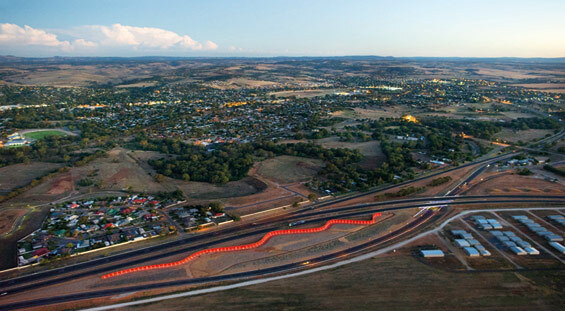 Where NEXY travels over the Gawler Bypass, large graphic artworks which were developed with Robert Owen and DTEI, are applied to the abutment walls with LED. 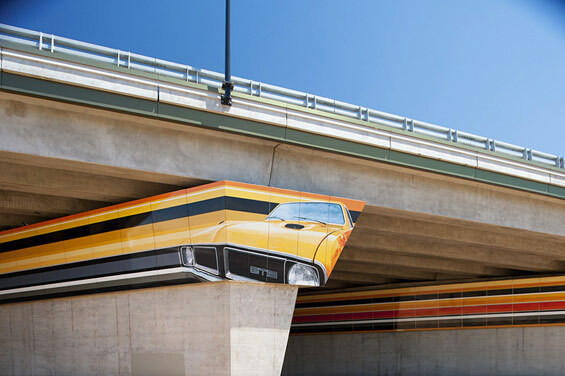 At the southern entry large supergraphic panels designed by TCL and Robin Eley wrap the Port Wakefield Bridge and reference the role of Holden in the manufacturing industry in Adelaide. All interchanges involved the integration of drainage detention basins as part of the extensive planting occurring at these locations. At Gawler River where a large borrow pit and diversion channel were required to handle large floods, extensive revegetation and the creation of ephemeral wetlands was designed. These included input from landscape architect Barrie Ormsby and close consultation with project engineers. After consultation with the local Kaurna community, a Kaurna Meeting Place was planned for the Gawler River site. This included car parking, shelters, toilets, camping and ceremonial areas. Over 700,000 indigenous and native specimens were planted in a massive contribution to the biodiversity of the region. Lighting was considered throughout the project with specialist LED fascia lighting to bridges, as well as horizontal banding lights on the batters beneath the bridges. 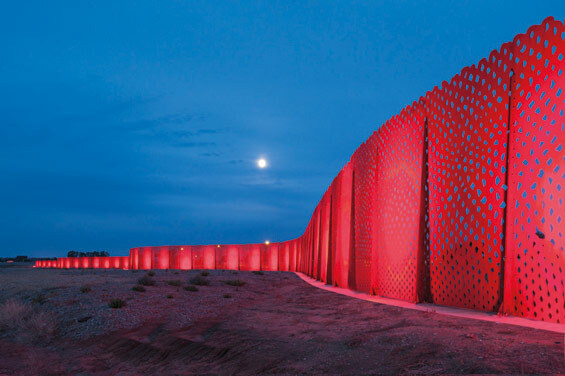 LED lighting is included on the Gawler Bypass sculptural installation, and solar LED lights are located along the shared use pathway that runs adjacent to the roadway.